November 29, 2018 – Weather conditions on Saturday September 29th, 2018 were just wonderful in Lugano. The autumnal sunny day, the shining lake and the mountain surroundings bestowed the perfect background for the conference devoted to “Swiss and Italian Monetary relations: The Early Middle Ages (VI-XI cent. )”, that Circolo Numismatico Ticinese (CNT) promoted and hosted at the newly-built exhibition and cultural centre LAC. The meeting offered the opportunity for specialists on early medieval coinage, coming from five different countries, to get together and present an overall and yet articulated framework of the complex monetary relations existing at the early medieval period within the subalpine region, which included northern Italy, present-day Switzerland and Central European states on the other side of the Alps. Early byzantine, lombard, merovingian and carolingian coins were presented in connection with new and old coin hoards as well as recent archaeological surveys. Stylistic enquiries as well as coin finds and archaeological contexts helped spread light on coins’ circulation, money usage, as well as on the large and little-known mints for the historical period considered. Specialists on early medieval coinage met in Lugano to discuss the complex monetary relations of the time. The congress was structured in two sessions, morning and afternoon, including four speakers each, chaired respectively by Giovanni Staffieri, CNT vice-president (Muzzano, CH) and Ermanno Arslan, Accademico dei Lincei (Rome). After the welcome remarks by CNT president, Fabrizio Rossini and a brief salute by the Canton Ticino Departm. of Culture representative, Raffaella Castagnola, the first speaker, Paolo Ostinelli (University of Zurich) aptly illustrated the geopolitical and historical framework necessary to put into context the period relevant for the conference topics (La regione subalpine nell’alto medioevo,secoli VI-X: un inquadramento storico). Arent Pol (University of Leiden) followed up providing an overview of the principal Frankish coinage in the Merovingian period struck in the area of today-Switzerland and northern Italy (Coinage in transition: the Frankish experience, 6th-7th centuries). Giorgio Fusconi (Piacenza) spoke about the stylistic evolution on the tremissis of the Lombard King Liutprand, suggesting the presence of small, possibly unofficial mints in the northern alpine Italy (Evoluzione stilistica nei tremissi di Liutprando e probabile attività di zecche periferiche longobarde nelle zone alpine). The last speaker of the morning session was Guillaume Sarah (IRAMAT-Centre Ernest Babelon, CNRS Orléans), who presented the current status of research on the most important pre-reform Carolingian hoard found at Ilanz, (Canton Grigioni CH) (The Ilanz hoard: a reappraisal). The afternoon session saw as the first speaker Simon Coupland (McDonald Institute of Archaeological Research, Cambridge, UK) who illustrated some methods to assign unattributed Carolingian issues of Louis the Pious to specific Northern Italian mints (The coins of the Hermeneches hoard and the Italian mints of Louis the Pious). Monica Baldassarri (University of Pisa) offered an overview of coin finds on the thyrrenian coast of Tuscany and on the islands of Corsica and Sardinia, with particular emphasis on the archaeological contexts in which they were found, crucial to deliver relevant data and info to help us better understand the historical period they refer to (I ritrovamenti monetali in area alto-tirrenica tra il VII e il X secolo d.C.: tipologie, contesti e distribuzione). Michael Matzke (IFS Bern) focused in his presentation on the early medieval coins from northern Italian mints found in archaeological contexts of the central and north-eastern areas of today’s Switzerland. His intervention provided a refreshing perspective about the circulation of those coins in the northern alpine region (Tra Po e Reno: le monete italiane altomedioevali in Svizzera centrale e settentrionale, secoli VII-X). Federico Pigozzo (Deputazione di Storia Patria per le Venezie) drew an interesting picture of the trade routes in and around Venice and how commerce along those routes impacted the production of coins in the XI and XII centuries, suggesting the existence of auxiliary mints, flanking the activity of the principal mint located in Venice (Dalle Alpi agli emporia dell’Adriatico settentrionale). 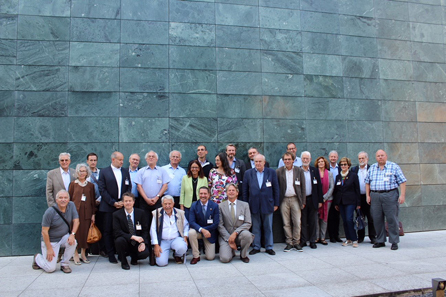 The event received financial support by Canton Ticino as well as the International Numismatic Council, represented at the conference by François de Callatay. Some of top numismatic firms also provided generous financial sponsorship, namely Numismatica Ars Classica NAC AG, Numismatica Genevensis SA, and Erwin Dietrich AG. The conference organisation was carried out by CNT, with Fabrizio Rossini, Luca Gianazza, Fabio Luraschi and Andrea Casoli among the main referents. A volume with the conference proceedings is in the making and is scheduled to be released by Spring of 2020. More information on future conferences is available on the Circolo Numismatico Ticinese website.